Arigna Natural Gardens » Garden Work and Saving Seeds. Garden work continues apace here in Arigna. 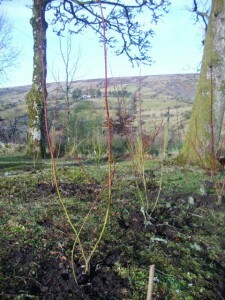 The last of the bare-root stuff was planted last week, into the earth and some in pots for planting out later. 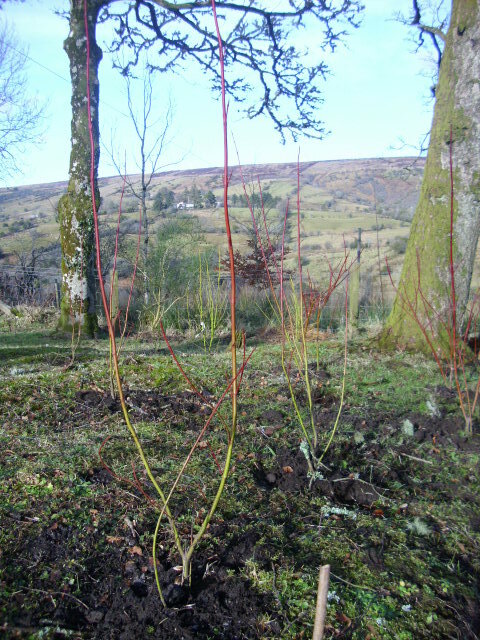 Dogwoods, red and yellow, were planted in the little tree plantation on the north-east side of the house. This area is in shade for part of the day but Dogwood can cope with that. The Dogwoods are a useful plant for difficult areas as they are easy to grow in most soils. Propogation is easy, just plant cuttings outdoors in Autumn. They give a lovely splash of Winter colour from their stems. Foxgloves were planted in the same area for early Summer flowers. In the polytunnels seeds are being planted, beds dug and manured and made ready for seeds such as Beetroot, Spring Onion and Spinach which are direct sown. The other major job at the moment is the annual cleaning of the polytunnel. This is done every Spring. It is amazing how much algae builds up over the Winter. If not cleaned this would keep out a lot of light and I’m sure it’s not good for the plastic either. You can see from the pic above the difference between the area that has been cleaned and the yet uncleaned area. This polytunnel is about 65 feet long so it’s a job that’s done in stages. The best time to clean is of course on a wet day, the rain makes the job a lot easier. Yesterday was Seed Swap Day at Cleen Hall near Knockvicar. This is an annual event organised by Knockvicar Organic Garden. The attendance was’nt huge, I don’t think people have as yet realised the importance of seeds and seed saving. Especially important is the saving of locally grown vegetable seeds. These will have been acclimatised to your area and better able to cope with the soil and climate than foreign grown seeds which usually come from Spain or Africa. Madeline McKeever of Brown Envelope Seeds was in attendance and gave two workshops on seed saving. She would inspire anyone to have a go at seed saving and is an all round inspirational woman. Check out the seed catalogue at www.brownenvelopeseeds.com. 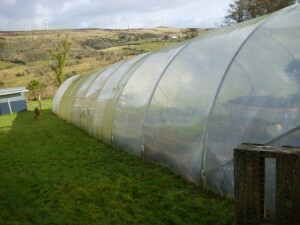 All the seeds on offer are open-pollinated varieties produced on the farm in West Cork. The catalogue is great and has nice images created by Mike Sweeney. 1 comment to Garden Work and Saving Seeds. madeline is certainly a mighty woman doing great work, a heroine for our time if ever there was! The dogwoods are going to look great and the foxglves too…looking good!